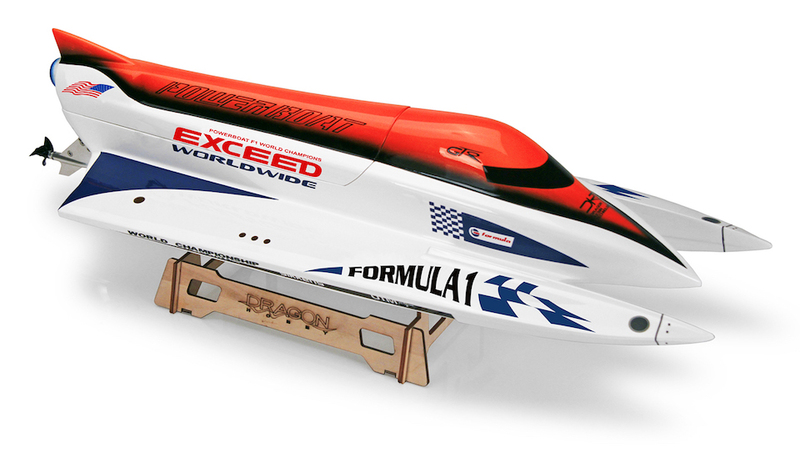 Experience the highest class of inboard powerboat racing in the world with the Exceed Formula 1 powerboat. The Exceed F1 620mm (24.4") Powerboats hull is constructed with a tunnel hull catamaran format capable of both high speed and exceptional maneuverability. The tunnel hull design creates aerodynamic lift due to a wing formed by the deck and under the surface of the hull. This increases lift and reduces drag allowing the boat to barely touch the water at high speeds. The entire hull is constructed of fiberglass allowing it to remain tough yet lightweight. A 4 step process consisting of resin/fabric, gel coat, paint, and clear coat allows the finish to deliver sleek gliding performance reducing drag while improving efficiency. This process also produces a superior finish providing resistance to ultraviolet degradation and hydrolysis. 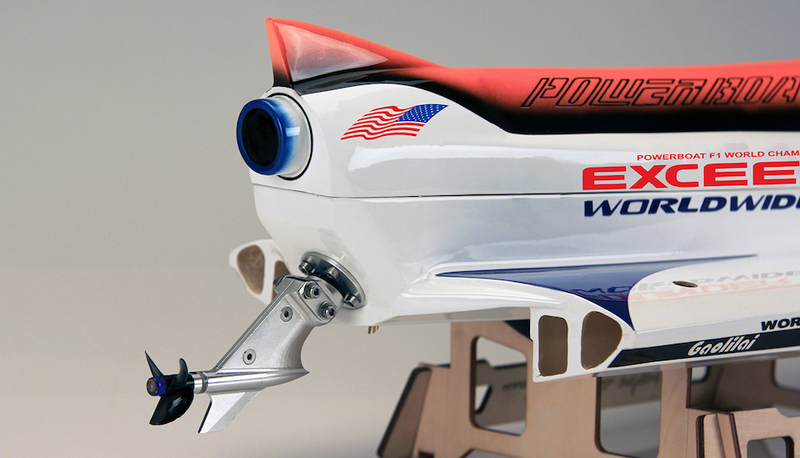 The Exceed F1 outboard motor is one of a kind. A 2850kv water-cooled brushless motor is encased in a fiberglass outboard motor shell which pivots for maximum water condition tuning and performance. The brushless motor mounted in the power head drives a collet housed in the midsection which drives the prop through a flexdrive shaft propelling the 3 bladed prop. The 60 amp brushless electronic speed controller is also water cooled through a water pickup found on the stern of the hull. The bottom half of the outboard motor including the skeg is constructed of CNC billet aluminum for maximum toughness and durability. 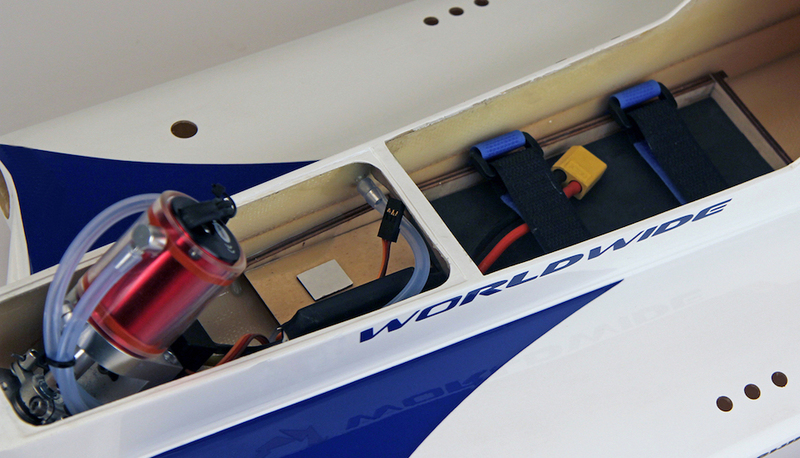 Upon removing the magnetized rear canopy of the F1 boat, you will find a balsa radio tray plate covered by a removable plexi sheet used to protect your receiver and outboard motor steering servo. Forward of this tray is a balsa seat with velrco provisions to mount your selection of a 11.1v 2200-4500mah rated lithium polymer battery. This F1 boat is exhilarating to operate and is one of Exceeds latest offerings. It comes almost ready to run with electronics mounted and ready to go. You will need a radio system, lipo battery, and charger to complete the build and be fully operational and ready to rip the water.